The system is a single-site solution with a local database, reports and a link to Sage 50 for invoicing. 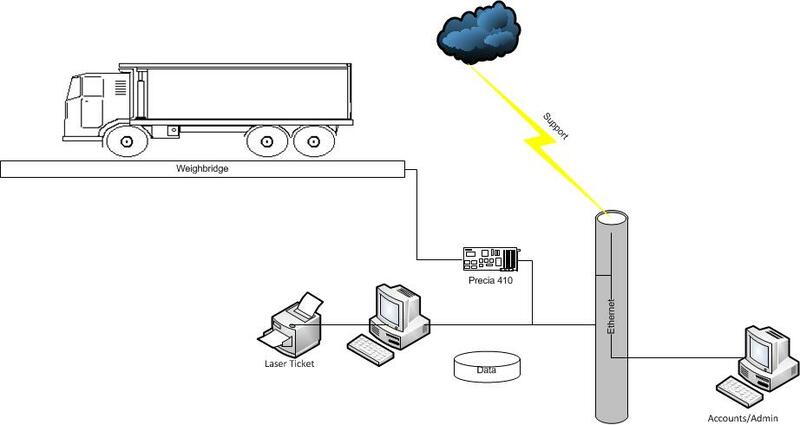 In the image to the left we have illustrated that the site has a single weighbridge, a weighbridge PC and an administration computer. Either computer can weigh, update the file data or invoice. The software links with Sage Line 50. With customers and suppliers entered in Sage, they will be collected from the accounts package on a scheduled basis and any transaction generated at the weighbridge will be validated and then posted to Sage. The software kernel is built using our Uniwin Plus application and has been configured to meet all the requirements as specified by Hereford Quarries. All completed orders and weighing transactions will be stored enabling operators to enquire historically and produce reports between defined periods. A vehicle arrives on site and the operator enters in the vehicle registration. All of the known data about the vehicle is displayed on the screen and the operator can enter in any additional information such as the product and the vehicle size before selecting to store the data. Once the transaction is complete a ticket with all of the delivery and duty of care is printed on the laser printer. The head office site's software links to Sage Line 50, retrieving customer account information and posting data to Sage for audit and invoice management. 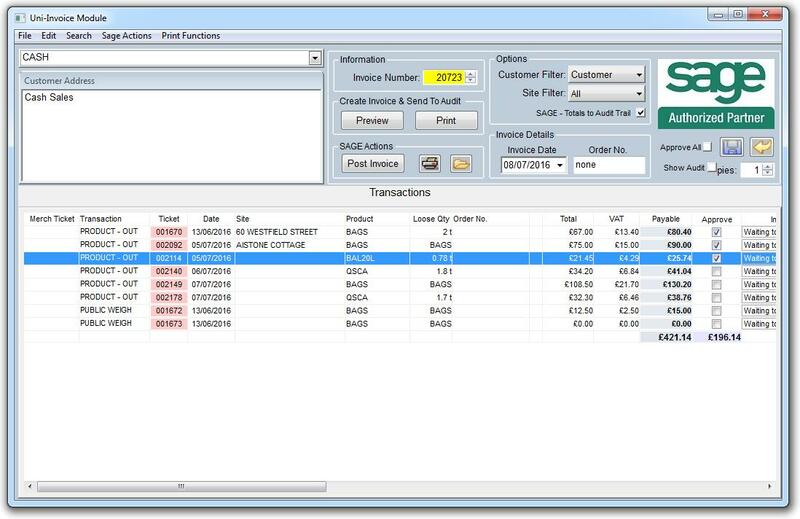 Our invoice module can be used validate transactions for valid prices prior to posting to Sage; this can be on a site basis or for all customer specific transactions. On the left is a screen shot of what the invoices look like.